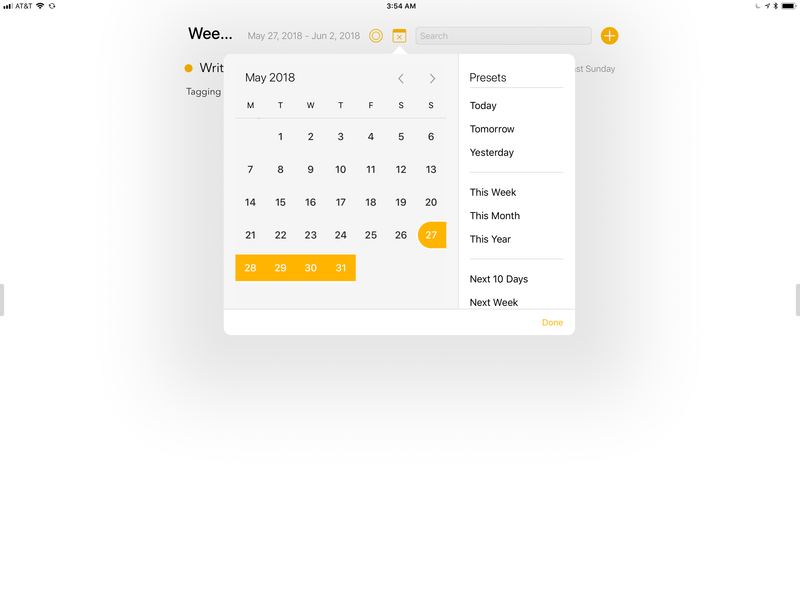 What makes Agenda a little bewildering at first is its use of dates and projects, which sometimes makes it feel like a calendar app and other times like a task manager, even though it’s neither. The app doesn’t try to force you into a predefined system. Instead, Agenda gives you multiple ways to organize and view your notes through tagging, filtering, sorting, and searching. The upside is flexibility that should accommodate almost anyone’s workflow. The downside is that it can take time and experimentation to discover how it can work for you. Navigation of notes is aided by a jump bar at the top of Agenda’s screen. 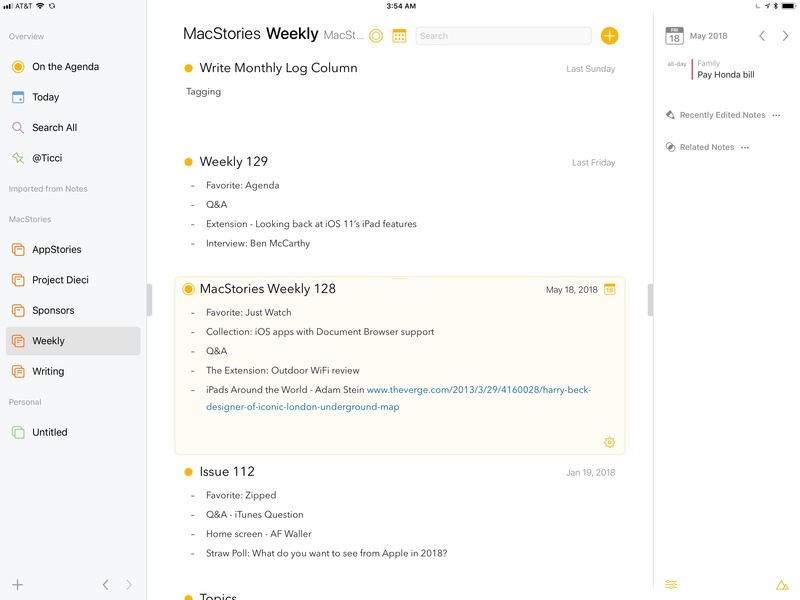 If you want, you could use Agenda a lot like Bear or Apple Notes. Set up Categories, which contain Projects, which in turn contain notes. It’s effectively a shallow two-level folder structure for your notes. The notes in a project can be tagged with keywords and people and dated, all of which are searchable by any of that metadata. However, merely organizing your notes by project misses the point of Agenda. By taking advantage of the app’s calendar and other functionality, you can transform Agenda from a list of notes into a work journal, planner, and reference material app, all rolled into one. A lot happens in a day, week, and month. As they work, many people occasionally jot something down to remember later. Maybe it’s scribbled in a notebook, on a scrap of paper, or in a text file stashed in a folder on your Mac or iOS device. As disparate, unorganized bits of information, notes like these aren’t very useful. Any date can be assigned to a note. However, if you move notes into Agenda and let the app assign the current date to them as you work, Agenda becomes an automatic record of your work over time. Can’t remember what you were asked to do on that call last week or the date you launched that big project last year? If you’ve consistently kept notes of what you’re working on in Agenda, those questions are quickly answered. Add to that keyword and people tags, and Agenda can become an outboard brain that will help you recall everything you’ve done. I used to do this sort of thing in notebooks. I didn’t do anything fancy, but I kept checklists of tasks, notes from calls, details about upcoming events, and other information chronologically in one place, which made it easy to find again. Of course, with the ability to tag items and search your notes, the process is even faster. Agenda lets you search by date with prebuilt time ranges or custom time periods. My only caution about keeping this sort of document of your daily work is that it’s an easy way to procrastinate. The trick is knowing what you might need to remember later and not getting hung up on creating an in-depth log of everything you do; they’re notes, not essays after all. My work week isn’t heavily dependent on the calendar. Phone calls and online meetings are rare, but I do have appointments to record podcasts and deadlines for some of my writing. If your day is tightly organized around the calendar though, Agenda’s calendar-centric features are fantastic. You can associate a note with a calendar event, which adds a link to the note in the notes field of your Calendar app. I’ve found the feature works best with Apple’s Calendar app, which recognizes agenda:// as a custom URL, which Fantastical does not. Notes can be associated with events in your calendar. Tapping on the custom URL opens Agenda to the linked note immediately. It’s a great way to keep information at the tips of your fingers during a meeting, for example. However, Agenda does not support collaboration. So, while I’d like to create a shared document with Federico with our notes for the next episode of AppStories and link it inside the calendar event for that episode, I can’t. For now, notes associated with an event are for your benefit only. I have notes in Apple Notes and Bear that I use every week as reference materials for specific tasks. With Agenda, you can put those notes ‘On the Agenda’ which is a way to surface them later. The concept is similar to pinning notes, but instead of simply floating to the top of a list, ‘On the Agenda’ has a dedicated section in the ‘Overview’ area of Agenda’s left-hand sidebar. It’s a convenient place for seeing just those notes while preserving the chronological order of lists of notes in Agenda’s project view. 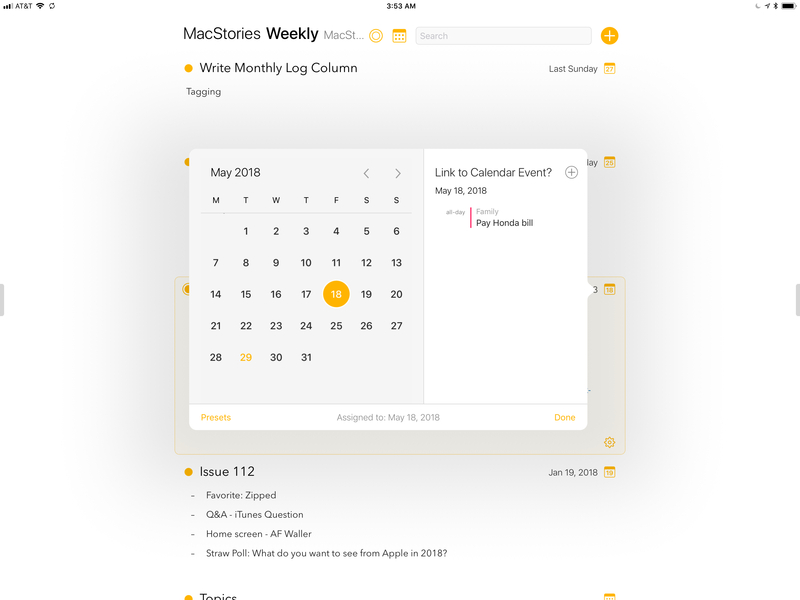 In addition to a lack of collaborative features, which I think would be particularly useful for calendar events like meetings, there are still a few aspects of Agenda’s design that I’d like to see worked on. As flexible as the app is from a note organization and search standpoint, the design is not. That’s not to say Agenda doesn’t look good – it absolutely does – but I would prefer options like a dark mode or themes, as well as more font choices. I’d also like to see blockquotes added to Agenda’s Markdown support. 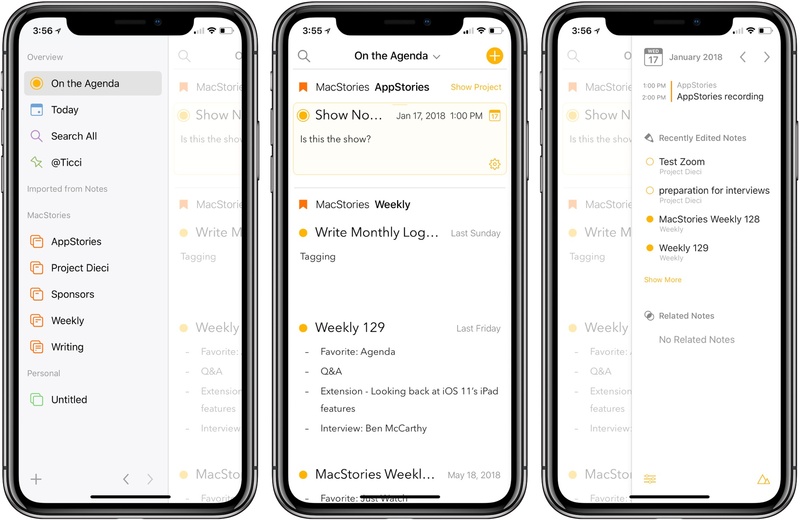 The addition of an iOS version of Agenda is a fantastic development that lets users access their notes wherever they are. Like its Mac counterpart, Agenda on iOS is polished, despite a few areas where I’d like to see the developers make more options available. 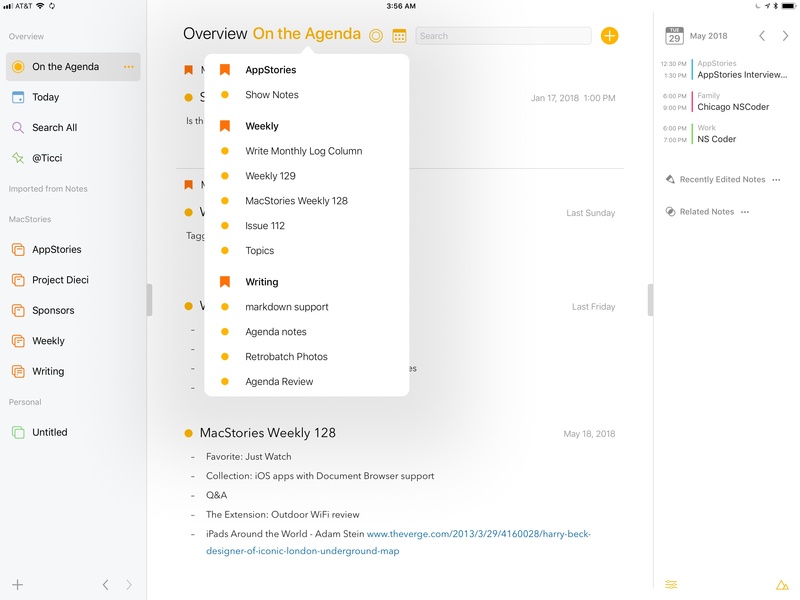 If the lack of an iOS version was all that was holding you back from trying Agenda, I recommend giving it another look. Although I’ve only been using the iOS version for a week, I don’t see myself switching away from my current combination of Bear and Apple Notes. As I said in my review of the Mac app, I use notes in conjunction with my task manager more than my calendar. Notes are parts of my projects and tasks, and rarely days and events. 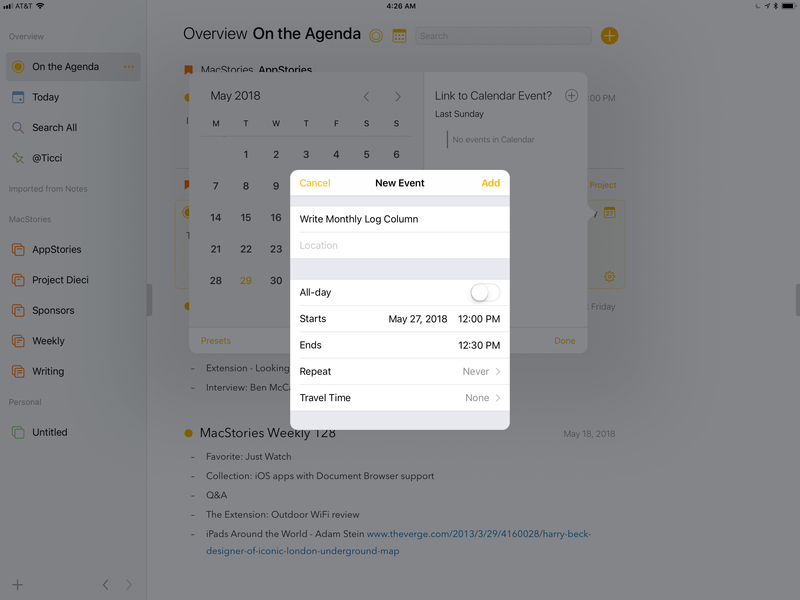 However, if your day is driven by meetings and other events on your calendar, Agenda’s date-based approach is unlike any other note-taking app and worth checking out. Agenda’s core features are available as a free download on the App Store. Premium features are available for $9.99 via an In-App Purchase that unlocks all current premium features and any others that are released within the next 12 months. After that period expires, the previous premium features continue to work, but new ones are only available by purchasing access to an additional 12 months of service.